I guess I forgot to post this months ago. It’s a comic I drew for my friend and colleague Shannon McLaurin. Shannon and I were hired at the same time four years ago and she’s been a great person to work with during that time. She, her husband and their gorgeous new baby daughter decided to move to Minneapolis in 2012. As a going-away gift, I drew her a comic. 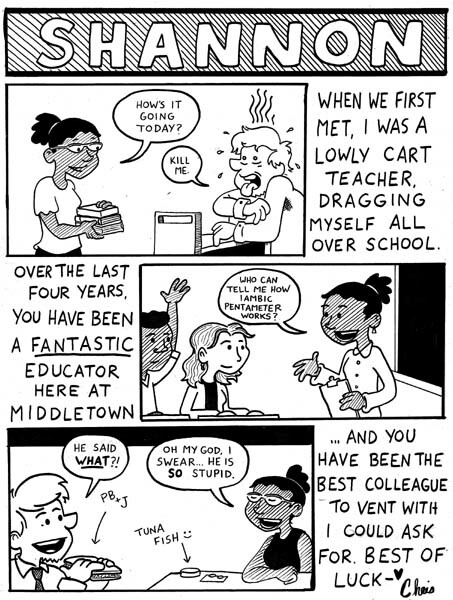 The comic references my first year as a traveling/floating teacher, where I worked off of a rolling cart rather than having my own classroom. 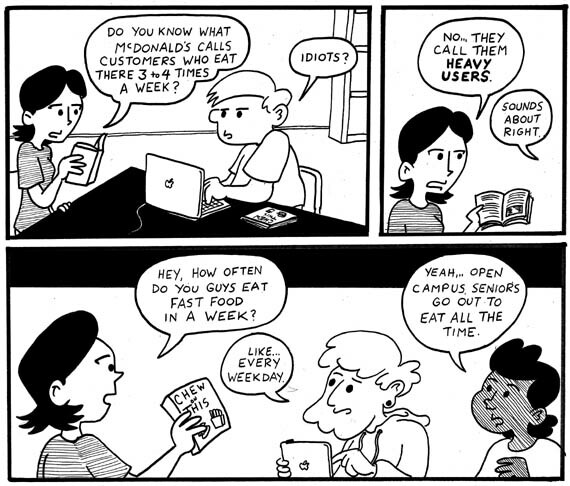 “Overheard in the halls” was a series of comics I meant to pay more attention to a few summers ago. 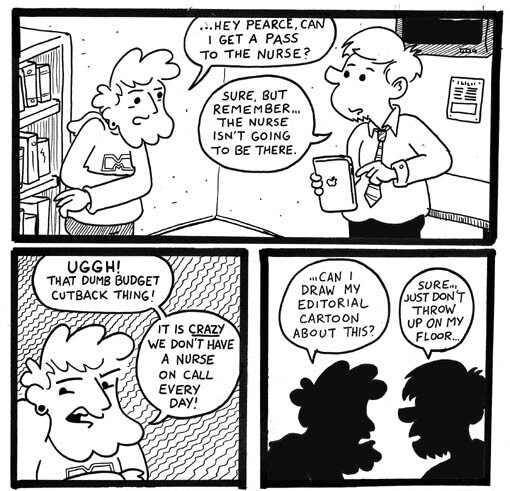 I will occasionally be lucky enough to accidentally eavesdrop on some of the funny/ridiculous things students say… and I thought that would be a rich vein to mine for these comics. For one reason or another, I never got around to doing a substantial amount of these (although there are a couple you can check out here). I’m going to do a couple this week though! Stay tuned. I don’t know if “open campus” is a practice which other high schools indulge… I know my high school didn’t have it when I was growing up. In brief: Upperclassmen who hit certain GPA and conduct standards are allowed to leave the campus for lunch. As an incentive, open campus seems to be a double-edged sword; while I believe it does inspire kids to do better in classes, the process seems almost impossible to monitor. Many kids skipping off campus for some Arby’s haven’t truly earned the privilege. 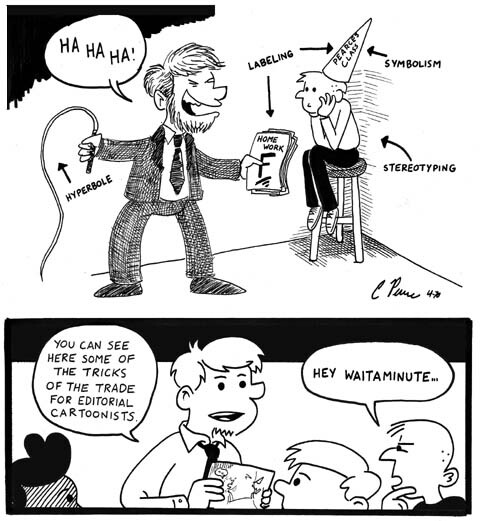 I never worked it in with the past ten weeks of comics, but all throughout the semester, students have been reading Chew on This: Everything You Don’t Want to Know about Fast Food by Charles Wilson and Eric Schlosser. Some of you might recognize Schlosser’s name; he wrote the bestselling novel Fast Food Nation. The book is a little easer than I wanted for a senior class, but it’s got all the material I wanted to cover… and it’s good in bite-size chunks. This is entirely true. Due to budgetary schools and some other issues, our school is without a nurse on Mondays, Wednesdays and Fridays. It’s one of those things where people will really take up and notice the problem immediately following some kind of problem where we desperately need a nurse on call and don’t have access to one. Here’s Danny’s comic about the situation; I thought it was rather good. It would be awesome if I were more talented and could have differentiated between my editorial comic parody and my normal style. Alas and alack… it was not to be. You are currently browsing the archives for the 2011-2012 school year category.